Posted by Toy Lady in Big Lug, meal plan monday, random stuff, Shopping With Peeps. You may have noticed – blogging around here has been a little sparse lately! 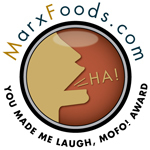 It’s not that I don’t have anything to say – I do! (Well, as much as ever, anyway!) It’s just that this is such a darned busy time of the year, isn’t it? Besides work, and my own garden, and work, and the pets, and the Boy (he’s just moved into an apartment! 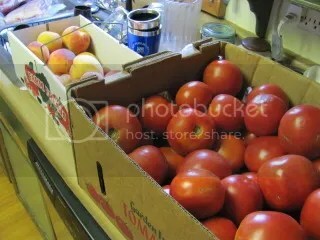 ), well, it’s tomato season! And peach season! Yup, both the pressure canner and the water bath canner have been getting a bit of a workout lately. . .
Of course, the easiest way for me to do any canning starts with getting the dog OUT of the WAY. And the best way to do that is to find him a nice, big, meaty bone – fortunately I buy them by the bag at the public market and stash then in the freezer. I’m tempted to take what’s left of this bone to the butcher and ask him for more – this thing kept the Jar busy through 2 batches of tomatoes, cooking dinner, AND he went back outside for it after dinner AND the next day! 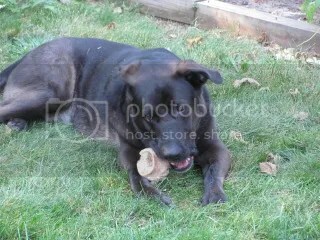 Now THAT is a good bone! 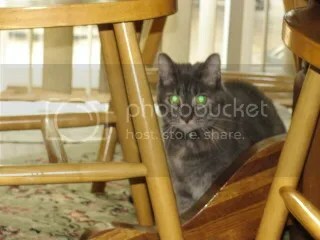 And somehow, the Kitty always knows when it’s safe to lurk – though sometimes her eyes do get a little, well, glowy. I’m convinced, though, that she’s truly not afraid of the dog. She just wants us to think she is. She definitely prefers for him to not be around, though – that’s for sure! Oh, hey, how about a little Shopping with Peeps? Well, sort of, anyway. We went to a different supermarket this weekend – they had some stuff on sale that we just couldn’t pass by. This store is in what you might call “the ‘hood” – it’s not the nicest part of town, though certainly not the worst part, either. Anyway, before we even got into the store, Peeps pointed out the PINKEST, most SPARKLY Dodge Durango that either of us had ever seen! 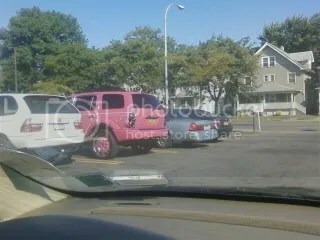 It even had dyed-to-match rims! I have got to say – if I were a pimp, I’d totally drive that car! We celebrated Labor Day on Sunday afternoon with my family – it’s a bit of a drive, but Sunday was the perfect day for a nice long ride. It’s a scenic drive, with farms and forests and hills and lakes. And construction. 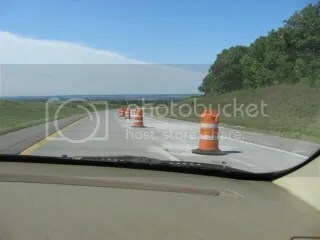 Miles and miles of cones! Fortunately, there wasn’t any actual construction going on during the holiday weekend – just an awful lot of single-lane highway stuff. But at least we didn’t get stuck behind that awful guy hauling the camper at 40 mph! He just hangs out in the back, watching the road. I know he’d prefer to be in the back seat (or even the front seat), but that’s not going to happen! It’s too much fun to watch the people in the cars we pass turn and stare at the GIANT DOG in the back of the wagon! And once again, it’s time for the weekly menu plan. As gorgeous as last week was, it looks like it’s going to be raining most of this week. We can still use the rain, though – it’s nice to see the lawns go back to being green! Monday – A couple of weeks ago, I got the Splendid Table e-newsletter, and it included a recipe for Spicy Shrimp Tagine which I knew I’d have to try before tomato season was over! Since I’m home Monday, I can fuss with it a bit. (Grating tomatoes? Really?) I’ll serve that with couscous (of course!) and, hopefully, I can pick enough green beans for the two of us! Tuesday – We are hoping that it won’t rain too much – our supermarket had whole chickens on sale (79 cents a pound – no WONDER we can’t get the freezer emptied!) and we do want to do this Greek spatchcock chicken – it was in my binder, which means we’ve done it before and liked enough to do it again, so, well, there you go! Peeps wants to do some pan-roasted baby potatoes, and we’ll probably have salad. Wednesday – The herb garden is crazy – CRAZY, MAN! That means, of course, it’s time to do the tuna-herb pasta that we love so much! Thursday – We’ve got an appointment after dinner, so we want to get the meal on the table quick – and get it cleaned up fast, too. Peeps suggested hot pastrami sandwiches and we’ll make either some macaroni salad or potato salad (that we never got around to making last week!). Friday – And again, it’s pizza night – last week’s pizza with the sauce that I mentioned last week was, in fact, a perfect pizza sauce! If I get to make more this week (come on tomatoes! ), I will, otherwise I’ll go back to my basic olive oil – tomato slices – fresh herbs. That is always a classic! Jarly is too cute 🙂 And wow — that’s some tongue he’s got there! I know what you mean about busy garden season. My tomatoes are finally getting plentiful. Wish I had the peaches, too! Enjoy Labor Day and your week. We’ll think about you over the Pasta Prima Donna! 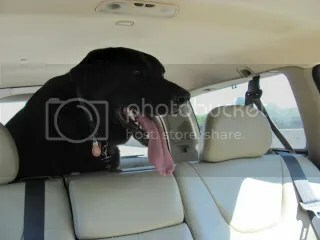 His tongue always seems to grow when he’s been panting for a bit – which he does when he’s all excited about going for a ride! You know, after a promising start, my tomatoes are actually something of a disappointment this year – I don’t know why. 😦 I’ve got enough for eating (mostly) but that’s about it. Definitely enjoy the pasta – I love that your family enjoys it! Great pictures of the “kids” sans The Boy. Apartment? Good. ‘the tomatoes looked beautiful even if you wish there had been more in the garden. And a trip OOT with the tongue and JAR. Hope you have a good week and have some energy for what ever you need to do. Oh, Judy, fall is almost as busy as the rest of the summer! Working on jam tonight – tomatoes tomorrow. Peach jam?? I will be there for breakfast! good for the jelling going on! I know you will enjoy it very much. Watch for those half-pint jars when you are out shopping!